No photo of Thomas Day has ever been discovered. Fred Wasser profiles Thomas Day (1801- circa 1861), who had a successful career as a North Carolina cabinetmaker in the decades before the Civil War. His home base for most of that time was Milton, North Carolina, in Caswell County near the Virginia border. His shop produced fine furniture and architectural ornamentation. He overcame serious obstacles during his rise to prominence. 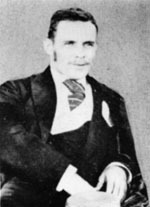 Thomas Day was a mixed-race "free person of color." Even though he wasn't a slave, Day and his family lived with restrictions and uncertainties. Thomas Day was also among a small percentage of free blacks who owned slaves. An exhibition, "Behind the Veneer: Thomas Day, Master Cabinetmaker" opened May 22, 2010 at the North Carolina Museum of History in Raleigh. A new biography is titled Thomas Day: Master Craftsman and Free Man of Color, written by Patricia Phillips Marshall and Jo Ramsay Leimenstoll, with photographs by Tim Buchman, Eric N. Blevins, and D. Kent Thompson (The University of North Carolina Press, 2010). Bill of Sale from Thomas Day to Green D. Satterfield, 1854. The wardrobe at left is listed on this bill. 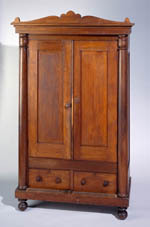 Wardrobe, poplar and yellow pine with scroll interior, made by Thomas Day for Green D. Satterfield, Roxboro, N.C., 1854. 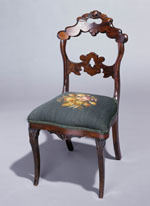 Side Chair, mahogany, mahogany veneer, rosewood veneer, and poplar (upholstery not original), made by Thomas Day for the James Poteat family, Yanceyville, N.C., 1855-1860.